For those who like a classic lamb look. The combination of stitches give the effect of lamb's wool. The construction of these boots allow you to replace the sole and toe area. 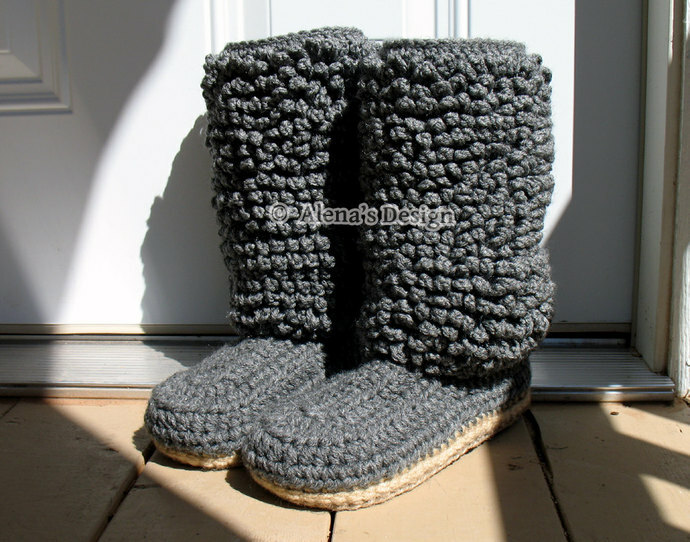 Also the Boots are made with two soles, yarn sole and jute sole. It makes the bottom of your boots more durable and flexible. You will need jute cord or jute twine which can be purchased at Walmart, other craft stores, and online. These boots are primarily for indoor use, but if you occasionally venture outside, this is not a problem. Two colors of Red Heart Super Saver, or other worsted weight yarn /10 ply (9 wpi). 7 (4.5 mm), and I/5.5 mm crochet hooks.